Star Wars Silver Stud: you can wear these studs on your nostril, ear lobe, and other areas to upgrade your style. 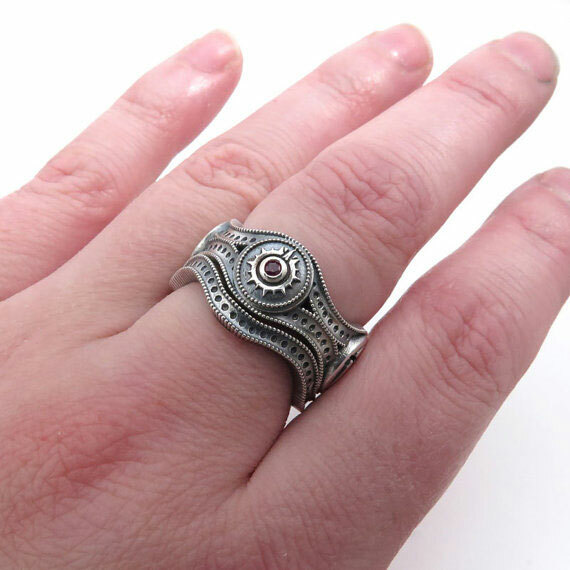 BB Spinner Ring: this beautiful BB-8 inspired ring has a head that spins and circumnavigates the ring. 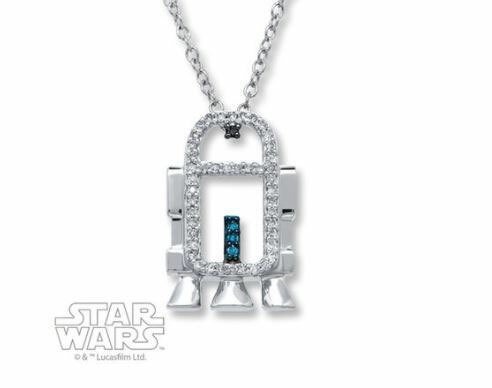 R2-D2 Diamond Necklace: a Star Wars necklace styled in sterling silver with blue & white diamonds. Totals 1/10 carat in diamond weight. 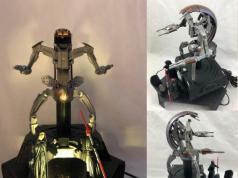 BB Kinetic Pendant: a handmade kinetic droid pendant available with 16, 18, or 24 inch chain. Made in sterling silver. 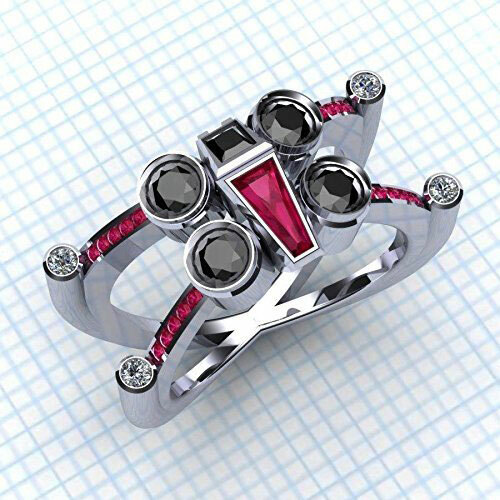 Han Band in Carbonite Ring: available with smoked rhodium coating with your choice of black diamond and ruby. 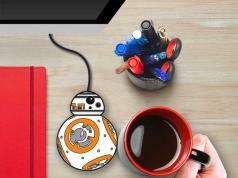 Death Star 10K Yellow Ring: another cool ring that lets you show off your fandom. It is crafted in 10k yellow gold. Artoo Gents Claddagh Ring: a beautifully detailed ring available in sterling silver, 14 karat white gold, palladium, or platinum. Designed by Paul Michael. 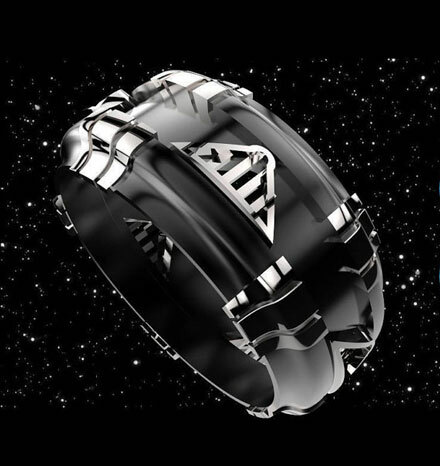 Aurebesh Spinner Ring: pretty self-explanatory. This spinner ring is for those of you passionate about the Aurebesh system. 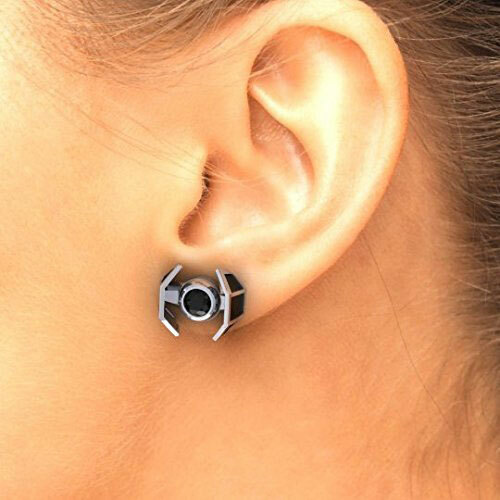 Tie Fighter Earrings: another awesome earring by Paul Michael. Available in Sterling Silver, 14K white gold, and yellow gold. 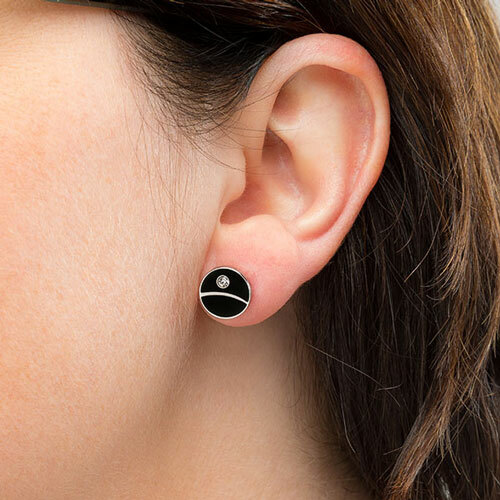 Death Star Enamel Crystal Earrings: black enamel studs with a rhinestone. These are officially licensed. My Wings are Crossed Ring: a 12x18mm ring for the ladies. 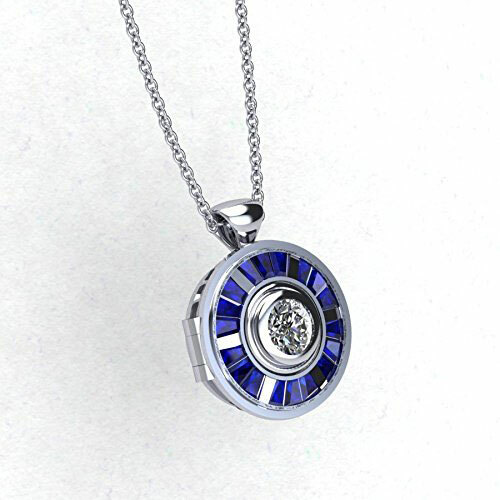 It was crafted from silver, gold, palladium, and platinum with rubies or sapphire. 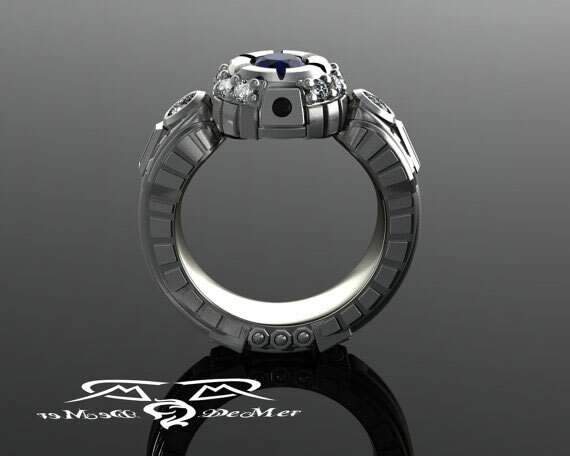 Lightsaber Engagement Ring: available in 14k gold and palladium, these can be customized with Rebel Alliance, Death Star, Sith, and other cogs. 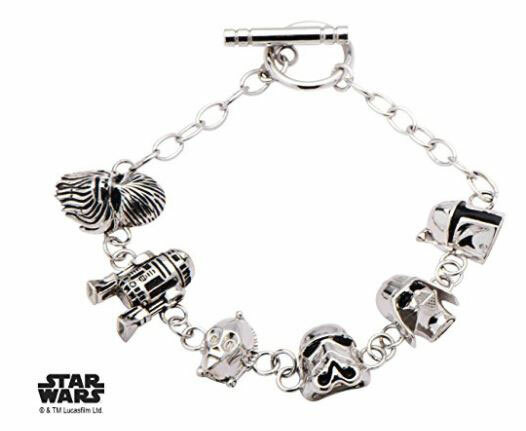 Star Wars 3D Characters Bracelet: lets you wear various popular characters from the franchise around your wrist. 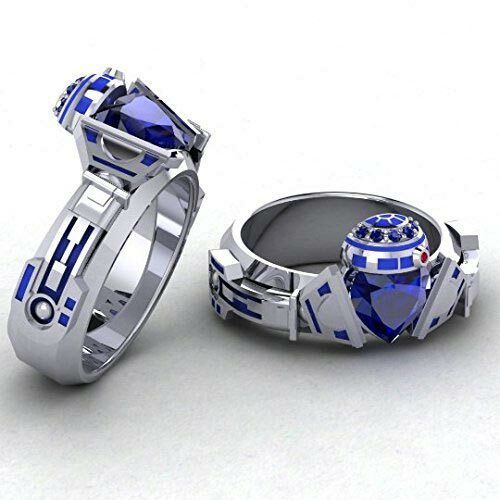 R2-D2 Engagement Ring: made in grey gold with diamonds and blue sapphires with handmade details and rounded corners. 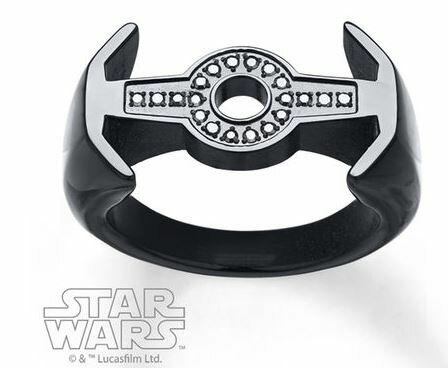 Star Wars Sith Wedding Ring: another geeky ring for special couples. 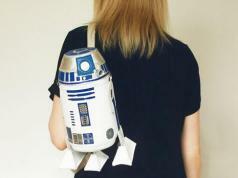 It is available with various cogs, including Rebel Alliance, Jedi, and Death Star. 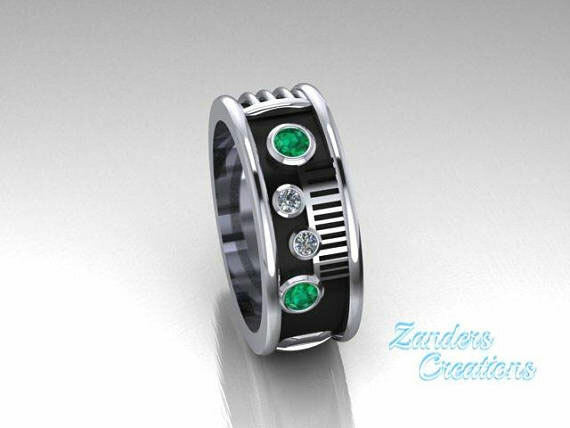 Saber Ring: made with AAA grade emeralds and diamonds. Available in white gold. My Wings are Crossed Earrings: we covered the ring version of this earlier. 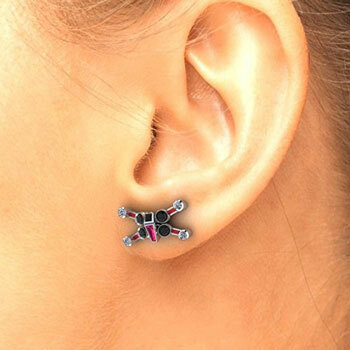 This one you can wear on your ear to upgrade your look. It comes with gorgeous rubies/ sapphires. 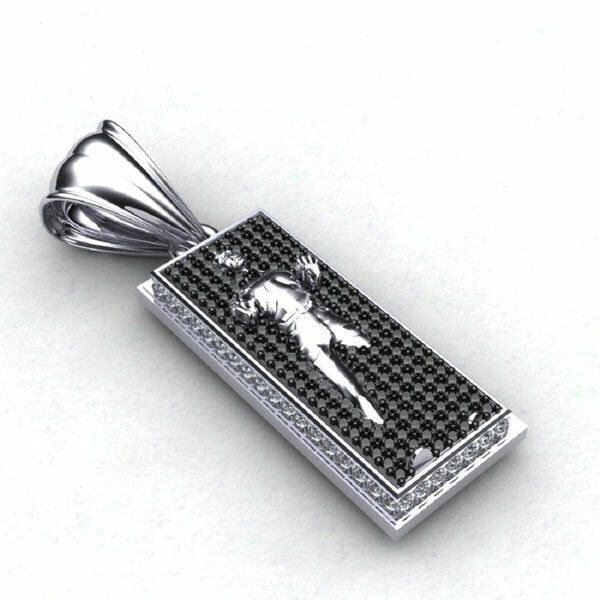 True Hero Pendant: a Han Solo in Carbonite pendant with white diamonds on the side and black diamonds on its face. Tie The Knot Ring: a cool ring modeled after the Tie Fighter. Has a 1 carat black diamond center stone. 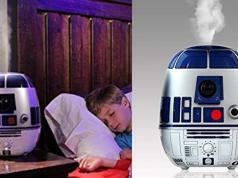 Droid Locket: a droid inspired locket with space for special photos and everything else you can think of. 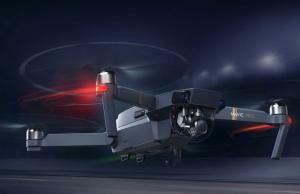 It comes with an adjustable chain. 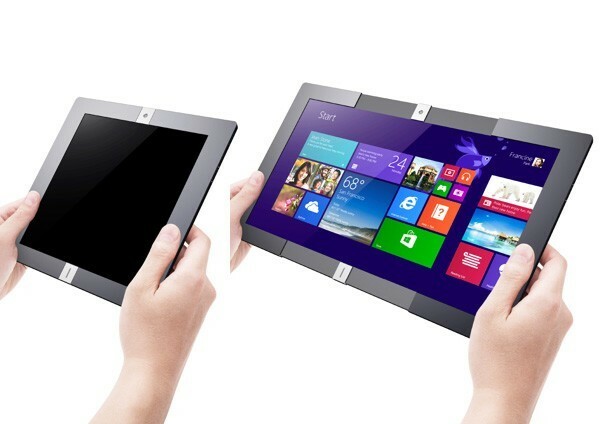 The metal and center stone are customizable. 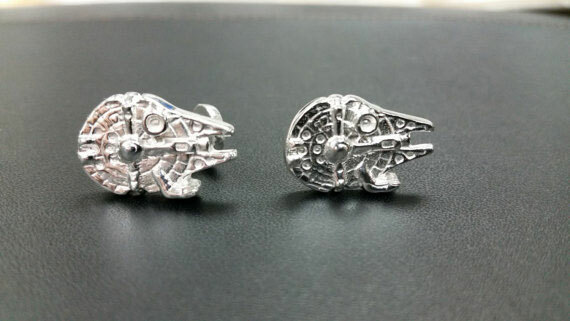 Millennium Falcon Cufflinks: adds a nice touch to your outfit. It can be made in sterling silver and gold. TIE Fighter Advanced Ring: 3D printed in wax and cast in sterling silver, these rings come in size 10. They have a black onyx stone at the center. 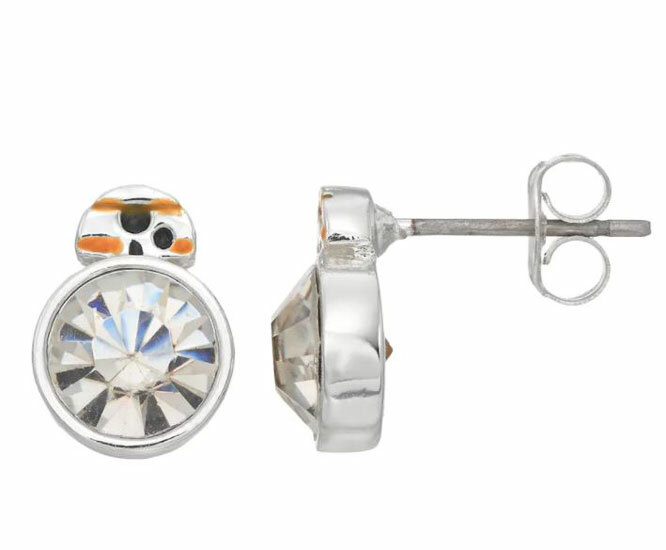 Silver Plated Crystal BB-8 Stud Earrings: an affordable cute little earring made of brass with silver plating. 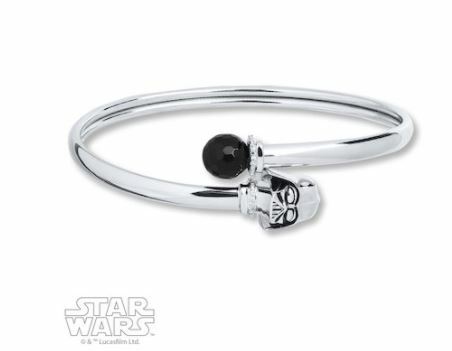 Darth Vader Sterling Silver Bracelet: has a round onyx on one end and Vader mask on the other. Not too expensive either. 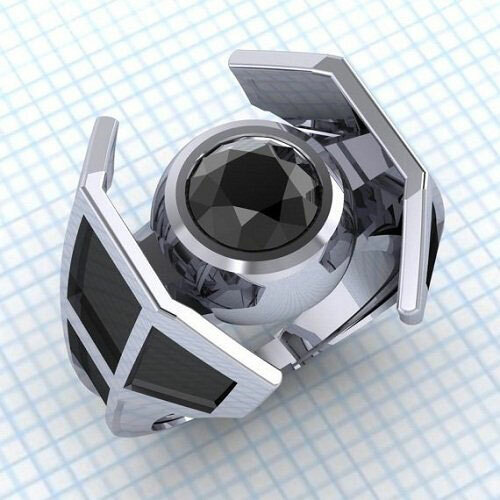 Darth Vader Ring: has elements borrowed from Star Wars. It is made of .925 sterling silver with rhodium plating. 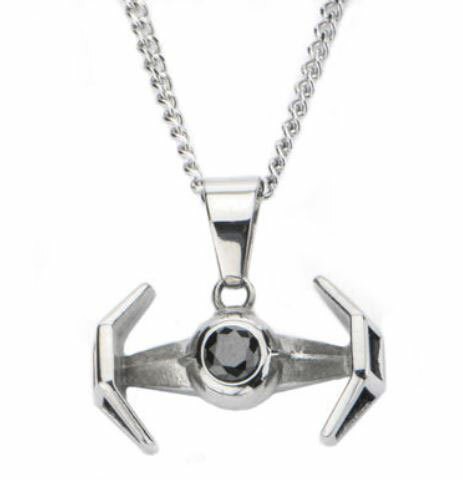 TIE Fighter Pendant Necklace: made of stainless steel, this pendant has a lobster clasp. It has a 18″ chain. 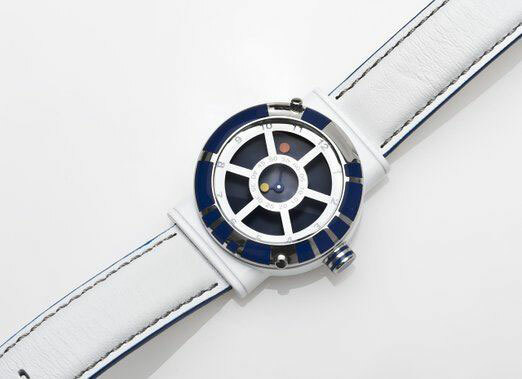 R2-D2 Men’s Quartz Analogue Collectors Watch: so you are tired of old watches? 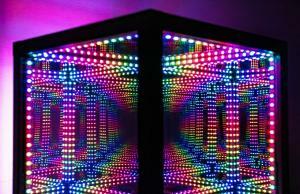 This one is worth a look. 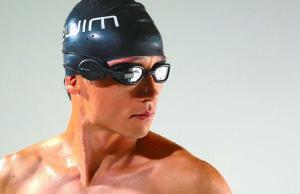 Has a stainless steel case and water resistant design to 50 meters. 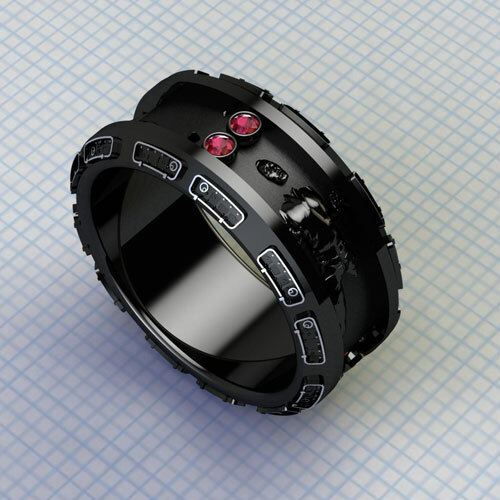 TIE Fighter Men’s Ring: a rad link in black stainless steel and diamonds. 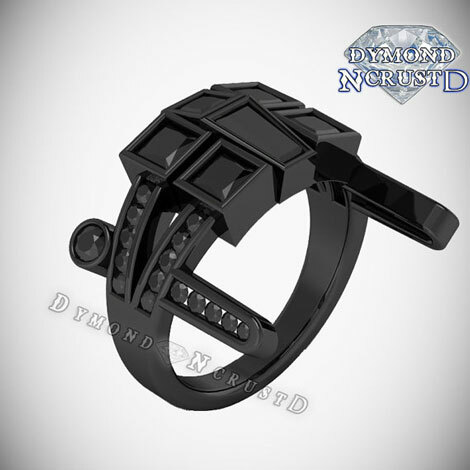 X-Wing Fighter Blackout Ring: features black Swarovski diamonds and can be made in silver or black gold (your choice). 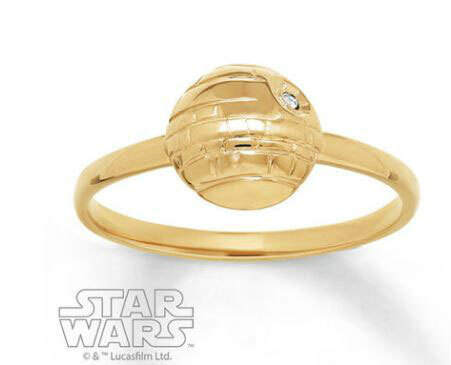 Death Star Ring Box: a beautiful box that goes well with your geeky engagement ring. 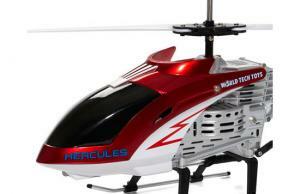 It is 3D printed in plastic or metal. 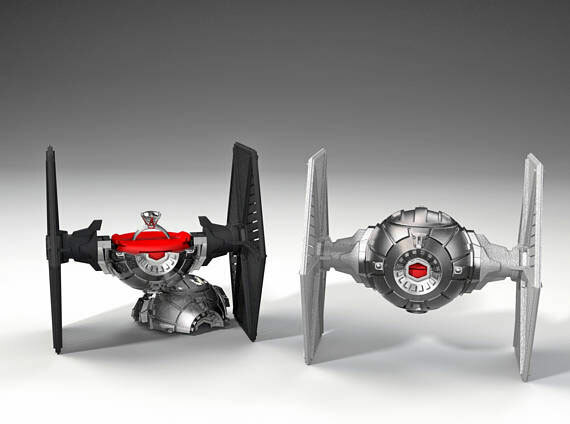 Tie Fighter Ring Box: 3D printed in metal or plastic. Comes with wings, insert ring holder, and everything other than the ring, which you will have to buy separately. 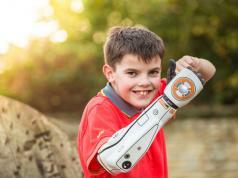 Which one of these are you impressed with the most?